The Global Lives Project can provoke meaningful dialogue in the classroom by going beyond the lesson of the day into enduring understandings about global citizenship that students carry with them for the rest of their lives. This can be particularly profound for an adolescent who is constantly evolving his/her own values and place in the world. 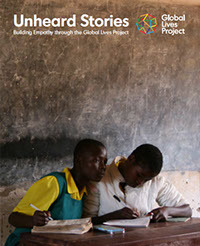 To this end, the Global Lives Project is pleased to offer our Unheard Stories curriculum to educators. of grade levels and abilities. Project video collection to engage students in storytelling activities. understanding of others, to empathy and social justice in society. Global Lives videos, homework and resources. International Educational Administration and Policy Analysis.